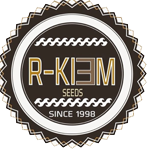 As one of the lesser known seed banks to appear on our site, R-Kiem still have quite a limited range of cannabis seeds available on the open market. But what they have to offer is simply exceptional and proves that this is a operation that is going places. Though this Spanish Seed bank is still quite small, their knowledge of cannabis genetics spans decades, bringing an impressive experience into every seed they create. All their genetics are grown and tested in their very own facilities in Spain where warm Spanish sun adds potency and flavour to the entire set up. If you want to experience an outstanding effect, try the R-Kiem self-named seeds which have potency and power unlike anything you’ve ever tried before. Simply browse through their selection, and see the best that R-Kiem Seeds has to offer. With innovative new ideas coming out of this seed bank all the time, you never want to be away too long. Make sure you come back to not miss their progress!